The photo of Aylan Kurdi, the drowned Syrian boy who washed up on a Turkish beach, is a heartbreaking symbol of the plight of Syria’s refugees. Aylan’s family had hoped to settle in Canada to escape the poverty of refugee camps, but due to an absence of international support, his family was doomed to rely on human traffickers in an attempt to get to the West. Combined, the 8 countries that sent the most weapons to Syria since 2011 only accepted 2 percent of the refugees Germany has taken in. This $16 billion in so called “military aid” has been entering Syria since the beginning of the civil war in 2011, providing support for various warring factions within Syria. Yet, the destruction these countries are waging on Syria comes not only in the form of war, but also in the callousness with which they treat those most affected by the war. Many of these same countries fueling the slaughter have also been some of the least willing to grant amnesty to Syria’s refugees. The same countries rushing to rip Syria to shreds for geopolitical gains refuse to take responsibility for their role or accept even a modest number of Syrian refugees. The international community has failed to properly fund the Syrian refugee camps in the poor countries that border Syria. The US bears a special responsibility for the devastation in Syria — and by extension its refugee crisis. ISIS, which is an outgrowth of Al Qaeda in Iraq, would not exist today if George W. Bush hadn’t invaded Iraq in March of 2003. Yet, Obama also bears a large responsibility for the tragedy in Syria. The US has been spending nearly $1 billion a year in covert military assistance for rebel groups in Syria, as well as spending $10 million a day on 6,550 airstrikes on ISIS, with 37% of those strikes taking place in Syria. According to a 2015 report from the Congressional Research Service, the U.S. has, since 2011, spent an estimated $7.7 billion in Syria in combined military and “humanitarian” aid — much of which ends up in the hands of ISIS. For all the Obama administration’s willingness to engage in the destruction of Syria, and all of his human rights rhetoric, he has shown little interest in assisting Syrian refugees. According to the International Rescue Committee, the US has accepted only 1,434 of Syria’s 4 million refugees (the US pledge to accept up to 8,000 has been criticized by the IRC). This is shameful, given the great wealth of the US government in comparison toIraq, Lebanon, Turkey, Egypt and Jordan—the 5 countries currently hosting 95% of Syria’s refugees. Other Western countries participating in Syria’s civil war are little better than the US. Britain’s role in the air war against ISIS has cost $122 million so far, yet it’s accepted only 4,866 Syrian refugees. Canada, which will spend $528 million fighting ISIS over the next year, on top of already allotting approximately $190 million in taxpayer dollars to funding the Syrian opposition, has accepted only 2,300 Syrians. European Union nationsjoining with the US in bombing Syria (UK, France, Belgium, Denmark, Netherlands) spent an estimated $882 million as of 2013, yet have only accepted just over 16,000 refugees combined. The Netherlands refuses to accept more than 250 Syrian refugees. Russia has played a large role in Syria’s war by supplying billions in weapons to the Syrian government. An estimated 10% of Russia exported weapons are sent to Syria. Russia reportedly has $1.5 billion worth of ongoing arms contracts with Syria for various missile systems and upgrades to tanks and aircraft, reportedly doubling that investment in small arms sales since the beginning of the Syrian civil war. Despite the very direct role Russia has played in the Syrian war, the country has currently only accepted 1,395 Syrian refugees on temporary asylum. The Gulf countries of Saudi Arabia, Kuwait, Qatar, and the United Arab Emirates have also played a significant role in Syria’s devastation, funneling billions in weapons and cash to Syrian rebel groups. Qatar alone spent at least $3 billion over just the first two years of the war. The Kuwaiti government — which has invested at least $800 million in Syria since 2010 — spent an initial $100 million funding the Syrian civil war, and funneled an additional $300 million into the country since 2011. Saudi Arabia, thought to be a leading source of arms for rebels by 2013, has partnered with Turkey and Qatar to funnel an estimated $136 million of arms to rebel groups across the border from Turkey in a new bit to bring down Bashar-al Assad. The United Arab Emirates sent $215 million (in alleged “humanitarian contributions”) to Syria since 2011. 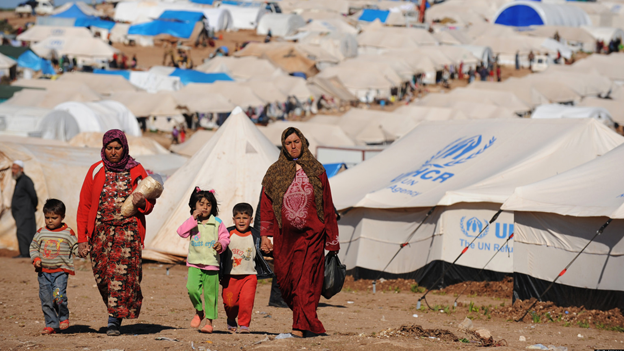 Not one of the Gulf nations has pledged to accept any Syrian refugees. In stark contrast, Western countries like Germany, Greece, Sweden, and Austria have been far more generous. Germany, for instance, is set to take in 800,000 Syrian refugeesby the end of this year. The Berlin-based Refugees Welcome is even trying to create an Airbnb for refugees. Throughout Germany a movement to assist asylum seekers is taking root. Other countries should follow suit. The instability brought to Syria has its roots largely in the US/UK, the Gulf, and Russia. If these countries don’t step up to accept far more refugees there will be many more tragedies like the death of Aylan Kurdi.